Just in time for the 2018 PyeongChang Winter Olympics. Popular for their versatility – they can be removed by unlooping them from the watch – and military connotations, NATO straps have been in vogue with watchmakers, arguably none more so than Omega. It’s sold several recent limited editions with matching NATO straps – from Speedy Tuesday to James Bond Seamaster – and has now gone all the way with 24 different NATO-style straps in varied colours inspired by national flags. Announced to coincide with the PyeongChang 2018 Olympic Games, the new straps are woven fabric with steel buckles and keepers. 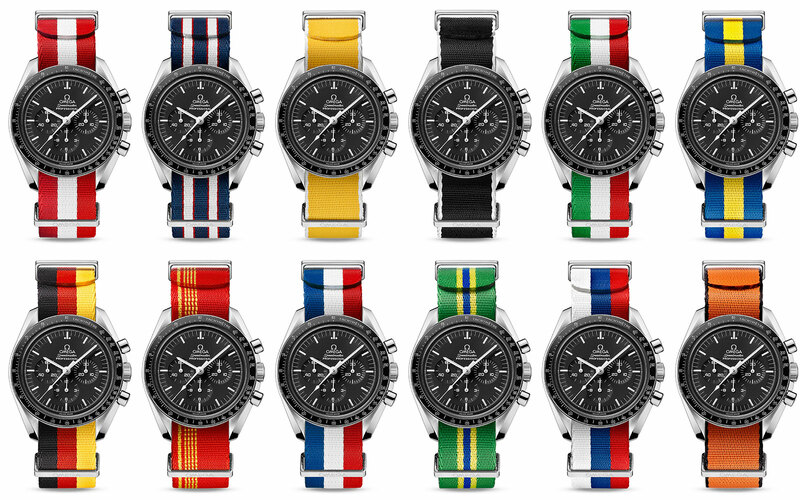 The line-up of straps comprises 18 modelled on the colours of the national flags of countries including the USA, China, Germany, France, and Italy, as well as another six straps in the colours of the Olympic Rings. They are available in 20mm and 22mm sizes, which fits all of Omega’s sports watches, joining the existing line of solid colour NATO-style straps in fabric as well as leather. Named after the British military spec fabric strap that has a NATO stock number, the bands loop under a watch, making it slightly thicker than on an ordinary strap. And the Omega versions are also significantly pricier than typical fabric straps, which tend to be US$50 or below. The full range of straps can be found on Omega’s website, along with a handy simulator that shows how each strap looks with various Omega models from Seamaster to Speedmaster. The NATO-style straps are available from Omega boutiques and retailers, priced at SFr150 or S$360. A simple, retro sports watch in five colours.